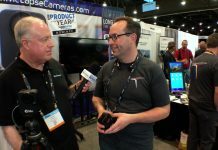 Dan Berube and Michael Horton, the organizers of the Las Vegas SuperMeet, talk about some of the things that will make this year’s event extra special. A new location at the Riviera, HP as a major new (and unexpected) presence on the SuperMeet stage, GoPro as a new sponsor, and a special presentation by iZotopeand are all part of the discussion. Oh, and did we mentionâ€¦RAFFLE!